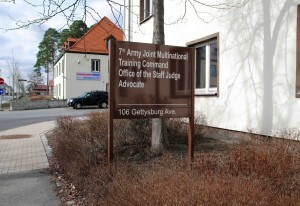 GRAFENWOEHR, Germany — The Seventh Army Joint Multinational Training Command, or JMTC, Legal Assistance Offices in Bavaria are now taking requests for appointments online. Service members and their families can request an appointment from any of the legal assistance branch offices in Bavaria. Locate your legal assistance branch office on the left-hand side of the Staff Judge Advocate webpage and click the button labeled “Request Appointment.” Then, follow the instructions on the website. Online appointment requests are available for anyone who is entitled to legal assistance. Appointments are available at Grafenwoehr, Vilseck, Ansbach, and Hohenfels.